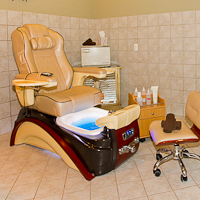 Enjoy the luxury of a private room where you sit back and relax in our "Elite" Pedicure chair. While sipping herbal tea, your nails are clipped, cuticles cleaned and callouses softened. The feet are then treated to a hot stone massage and a hot towel wrap, follwed by an AVEDA foot massage. A nail polish of choice completes this wonderful experience. Gift Certificates available for all services and products. We welcome you to our spa and hope that you have a memorable experience with us.